Kathy McKeithen has declined to run again for the council. 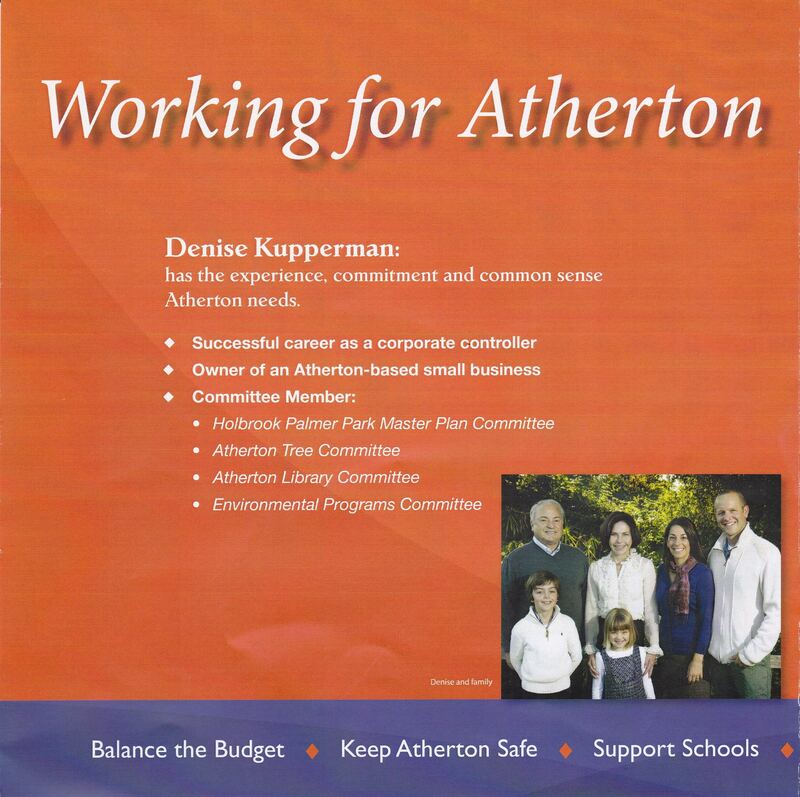 Yet, the decision by Denise Kupperman, longtime Chair of the notorious Atherton Library Building Steering Committee, to run for council makes it sadly clear that McKeithen’s toxic influence may not go away all that quickly. Could Kupperman, who for the past three (?) years has been leading the charge for Kathy McKeithen on the Library Committee, not be complicit in the well-known effort by this rogue committee to impose their will on the community but pretend that they didn’t? Kupperman is no dummy. She’s been at the center of the process and the public face of it. As an accountant, could she fail to have noticed that the abbreviated community process did not result in any data/input/results of a fruitful community engagement process—or even a free and open discussion by the community, which sadly has never been allowed to happened. Doubtful. Rather, she along with McKeithen have tried to make people simply believe that our community should want what is the strong preference of the joint Library team (the Library Joint Powers Authority and the Atherton Library Committee (the ALBSC) even though they were never willing to allow us that chance to actually discuss it along with all of the related issues about competition for park use and technology use and decide. They deny their corruption of process and try to point the finger at those who have pushed back on these tactics, to say we should feel like terrible people for not supporting the library . . . ! Holbrook-Palmer Park? Landscape Master Plan? Wasn’t that done in 2005? Let me ask you: Who fails to even mention that they were the Chair of a very high profile town committee that is working on the biggest development project in the town’s recent history on their campaign website? Obviously, someone who wants to re-write her own past and distance herself from prior handiwork. Someone who is aware of the controversy surrounding how her committee operated and the disrespect it has shown to the community and prefers not to emphasize her own involvement to those who are unaware of it. Also, someone who is willing to be less than completely forthright in order to get into a powerful position, so she can continue to flog her own (not so secret) agenda. Someone has had “Chair” removed from next to Kupperman’s name on the town’s ALBSC website. Also, with so many of the ALBSC members listed as both supporters of hers and on “Yes for Measure F”—why isn’t Kathy McKeithen listed? This sounds like Ms. Kupperman has learned well from Councilmember McKeithen. I am sure, if she is elected, she will carry on McKeithen’s long-standing tradition of re-writing reality to fit her own interpretations of the truth and keeping the public in the dark, especially about her own private agenda-filled actions, so she can freely point the finger at others. Councilmember McKeithen is soon to be completing her THIRD TERM. She has now been on the City Council for twelve years. Much like her commitment to TERM LIMITS—she seems to say one thing and do the opposite. If she actually were doing what she says her priorities are, it is very likely things in Atherton would be okay. Unfortunately, residents don’t feel respected at all. Resident input on important matters, such as McKeithen’s pet library project, has been utterly ignored while her committee mushes ahead doing what they want. And there is a lot that is going badly in Atherton. Residents recognize that the town is having many, many problems. The town has now gone nearly two years without having been able to hire a permanent town manager. The last Interim Town Manager the town had quit abruptly six months ago. There is yet to be any appointment. The council is completely divided: the majority appears to be going “rogue” and, with no professional management to provide guidance, the council majority is taking actions with virtually no accountability to what is in the best interests of residents. While the town has had continuous controversy and acrimony over the last twelve years, things are much worse than they ever have been and Kathy McKeithen is in the center of it all. It seems like a good time to take a good hard look at what she is doing and whether or not McKeithen has lived up to ANY of her stated priorities. The problem is, not only isn’t there any transparency, there isn’t any coherency either. Her notion of “responsive stewardship” feels more like covert deconstruction and conspiratorial agendas to strip rights (and now the park tennis courts) away from residents. When one looks merely at the facts of what Kathy does, it makes little sense. I find that I have many more questions about Kathy McKeithen—and especially why she does what she does—than I have answers. I wish I had the answers. I am therefore going to do what I can, and write down my questions. I am hoping that those of you who read this, can fill in some answers. I’ll attempt to provide some answers or simply theories about why she does what she does, but please add your own insights where you can. Use the open comment links but it is best that everyone respond anonymously. These are perilous times in Atherton and, given what we know, anyone who ventures to critique Ms. McKeithen will get accused of something! Atherton has lost most all of the members of the council ever attacked, plus all of the town senior management attacked, numerous veteran town staff (including many long-term, highly dedicated employees not mentioned because no specific accusations were publicized) Police Chiefs, Heads of Building Department, Public Works, Town Managers, Finance Directors, City Attorneys and others. These departures have cost Atherton dearly in the value of the accumulated expertise and stability: how many of her accusations have ever resulted in findings of real malfeasance? 1. Lawsuit to prevent Lindenwood Urns from moving to the other side of Atherton. Total cost to Atherton was: $_____________? 2. Lawsuit over Menlo-Atherton High School installing stadium lights. Total cost to Atherton was: $_______________? 3. Lawsuit to prevent Menlo-Atherton High School from building the Performing Arts Center. 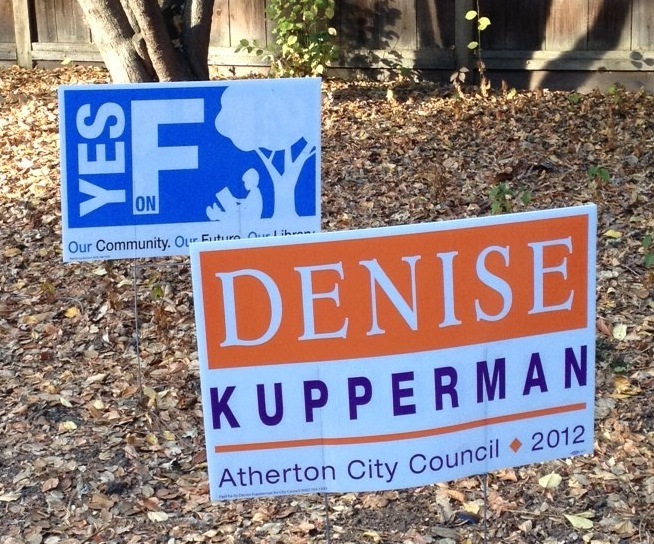 Total cost to Atherton residents was: $_______________? Atherton lost all of these lawsuits, as far as I know. Does anyone know what the total damage to the town was from McKeithen’s eagerness to help her biggest supporters? I know that Kathy McKeithen has opposed the town’s renewing Parcel Tax in the last two campaigns for it. Why does she oppose the Parcel Tax, which is used primarily to help maintain the level of support that Atherton residents want from their Police Force? For someone who claims to be trying to improve town finances, this seems rather strange. Why has she made accusations against the police? Why does she seem to have such a bad rapport with the police, whose union has chosen to videotape most all of the council meetings? Why do they think that residents should be made aware of what McKeithen is doing? What does the police force know that residents don’t know?